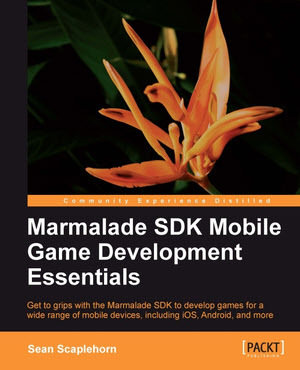 Wave 1 are very proud to announce that Sean’s programming book, Marmalade SDK Mobile Game Development Essentials has now been published by Packt Publishing and is available directly from the Packt website or from Amazon. This book is aimed at anybody who already has a good grasp of games programming in C++ and wishes to transfer their skills into the exciting world of mobile development. It shows how to make use of the cross platform Marmalade SDK which allows you to write your game once in C or C++ and then target several mobile platforms including iOS, Android, BlackBerry PlayBook and soon Windows Phone 8! You will discover how to use Marmalade to implement 2D and 3D graphics, how to detect inputs from touch screen, key pads and accelerometers and how to add sound effects and music to your games. The book also covers such topics as user interfaces, localisation and writing games that can run on as wide a range of target devices as possible. Sample code is provided to accompany the book which includes full source for a sample game that evolves from chapter to chapter as new areas of development are covered. The book is available in print, eBook and Kindle editions.